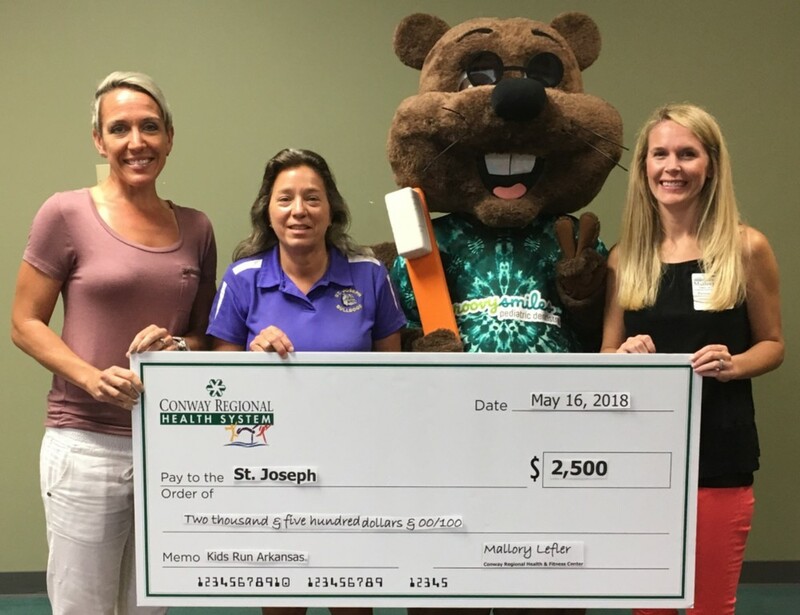 On May 16 St. Joseph Physical Education teacher Karen Vandivere was presented with a facsimile check for $2,500 by staff from the Conway Regional Health System for winning 1st Place in Kids Run Arkansas for the 9th consecutive year. Winners are determined by the level of participation from each organization represented. St. Joseph had 350 runners. The run took place on April 27th. Seen here are Conway Regional Marketing Coordinator Amanda Castillo, Ms. Vandivere, Conway Regional Fitness Coordinator and Race Director Mallory Lefler, and Sunny the Squirrel from sponsoring entity Groovy Smiles Dentistry.